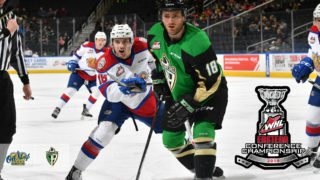 The Edmonton Oil Kings began the 2018-19 season with five straight wins, but followed that up with eight straight losses. They rebounded with another string of five consecutive wins, but in their most recent action on Saturday, fell to the Swift Current Broncos in overtime. They were out to buck the looming, losing trend on Friday night against the Kootenay ICE – and they did just that. 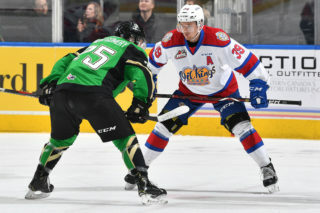 Quinn Benjafield notched a three-point night with a goal and two assists and rookie Tyler Horstmann picked up his first career Western Hockey League goal as the Oil Kings (11-7-1-1) skated to a convincing 5-2 victory over the Kootenay ICE (6-10-2-1) in front of 2,160 fans at Western Financial Place. 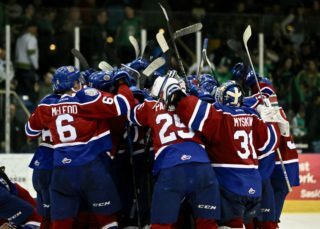 When scoring the game’s first goal heading into tonight’s game the Oil Kings were a perfect 9-0-0-0 on the season, and they improved that mark to a perfect 10-0-0-0 as Horstmann’s early goal gave the team the lead just over two minutes into the game. 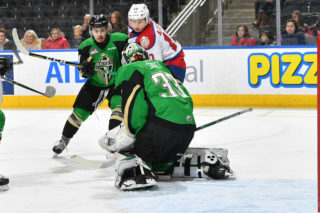 But after falling behind 2-0, the ICE would eventually tie things up, 2-2, in the second period before a late Oil Kings marker to end the middle frame gave them a one-goal lead heading into the final 20 minutes. 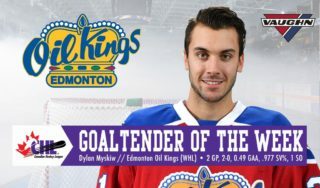 Dylan Myskiw (8-5-1-0) got back in the win column, turning aside 32 of 34 shots he faced for his eighth win of the season. Duncan McGovern (5-6-2-0) took the loss, surrendering four goals on 37 shots. 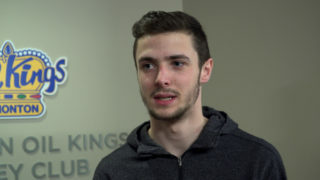 Trey Fix-Wolansky returned to the Oil Kings lineup from his time as a member of Team WHL at the CIBC Canada Russia Series and kept his point streak alive, registering a goal to give him 22 points (6G, 16A) in eight straight games. Horstmann’s first of his WHL career came on the 15-year-old, Richmond, BC native’s first shift and first shot of his first WHL game to give the Oil Kings a 1-0 lead just 2:24 into play, with Wyatt McLeod and Benjafield picking up the assists. With 3:25 to play in the opening frame it was Edmonton captain Fix-Wolansky who etched the scoresheet with his 12th of the season to make it 2-0, from David Kope, to send the game to the first intermission with the Oil Kings outshooting the ICE, 16-10. The first half of the second period Kootenay clawed their way back, as just 31 seconds in Martin Bodak tallied his third of the season with a power play goal to cut the Edmonton lead in half, 2-1, from Brett Davis and Peyton Krebs. It was a 2-2 game when Jaeger White notched his 11th of the campaign, from Krebs and Brad Ginnell, at 9:01. But before the period was out the Oil Kings would regain the lead, as Liam Keeler tipped in an initial shot from Carter Souch to make it 3-2, Edmonton at 19:01 with Benjafield picking up the second assist and his second point of the night to close out second period scoring. Shots on goal through 40 minutes of play favoured the Oil Kings, 27-24. Edmonton would take over in the third, with Benjafield picking up his third point of the night and eighth goal of the season to extend the Oil Kings lead to 4-2, from Souch and Logan Dowhaniuk at 15:41, before Brett Kemp secured the win with an empty net goal – his 12th of the season – assisted by Andrei Pavlenko at 19:03. Shots on goal were 11-10, Edmonton in the third period, and 38-24 Oil Kings overall. Kootenay was 1-for-3 on the power play while Edmonton finished the night going 0-for-2 with the man advantage. Duncan McGovern (KTN) (3), Quinn Benjafield (EDM) (2), and Peyton Krebs (KTN) (1) were selected as the Three Stars of the Game. The Oil Kings are back in action tomorrow night, November 10 when they take on the Medicine Hat Tigers at 7:30 PM MT at the Canalta Centre. They return to Rogers Place on November 17 when they host the Kelowna Rockets at Rogers Place at 7:00 PM MT for Wizards & Witches Night.